Firestone QuickPrime Plus may also be used to clean EPDM Pond Liner prior to the application of Firestone Splice Adhesive. See the Firestone EPDM Accessory Instructions in the Reference Section for Installation Details. Stir QuickPrime Plus thoroughly before and during use. QuickPrime Plus must be applied with a QuickScrubber or QuickScrubber Plus pad and handle using long back and forth strokes with moderate-to-heavy pressure along the length of the area until surfaces become gray in color with no streaking or puddling. Allow the QuickPrime Plus to flash off completely according to the touch-push test (usually less than 10 minutes, flash off time will vary depending on ambient air conditions) before applying QuickSeam products or Lap Sealant. 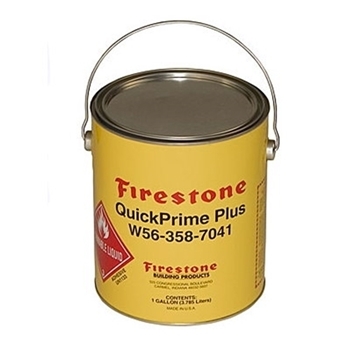 Complete QuickSeam product or Lap Sealant application in accordance with Firestone Specialty Products specifications and details.